1. Let's start with the good news on the injury front. Clay Buchholz made his season debut Saturday after missing his first couple of turns recovering from a flexor strain suffered September 2018. Buchholz tossed six strong innings, scattering 6 hits and allowing one run. When healthy, Buccholz is a very effective starter. He was 7-2 with a 2.01 ERA in 16 starts last season. The problem is, Buchholz has been on the DL virtually every season he's been in the majors. The Blue Jays will surely be managing his innings. 2. The other bits of good news on the injury front is Justin Smoak and Danny Jansen returned to the Blue Jays lineup after both missing time with neck injuries. Smoak jacked a huge three run HR in his return to the lineup Thursday. It is expected he will platoon with Rowdy Tellez at first base with expected reduced playing time as Tellez improves and develops. Smoak may even be trade bait at the deadline. Danny Jansen has become the primary catcher for Marcus Stroman and will be platooning with Luke Maile behind the plate. 3. The news wasn't so great on Ryan Borucki, who needed a cortisone shot for his ailing pitching elbow this week and will be shut down from throwing for two weeks. One has to be concerned that something more serious is going on. Hopefully last year's rookie sensation won't require TJ surgery, and if he does make the decision soon so he has a chance of coming back in 2020. 4. Jonathan Davis has started running and taking BP. The Blue Jays outfielder sprained his ankle towards the end of spring training. It's expected that he'll get a shot at a roster spot when healthy. So far, Socrates Brito has not worked out at all and Teoscar Hernandez is iffy at best in the outfield. Ideally, Hernandez serves as the Blue Jays DH. 5. Ryan Tepera is getting closer to rejoining the Blue Jays bullpen. He started a rehab assignment last weekend and shouldn't need too many games to get up to speed as he'll be a setup man for Ken Giles. Tepera survived a scare when it was determined he did not require season-ending Tommy John surgery. 6. 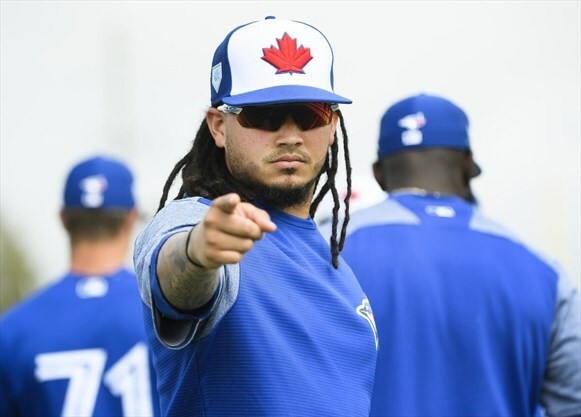 A pair of Blue Jays may find their roster spots in jeopardy with Jonathan Davis, Ryan Tepera, Vlad Guerrero Jr. and (possibly) Bo Bichette all expected to be ready to play in the near future. Lourdes Gurriel Jr. lost his roster spot late Sunday as the team optioned him to Buffalo after unforgivable defensive miscues over the weekend (Eric Sogard will take his place on the roster). On Sunday in the 3rd inning, with two outs and a man on 1st, Gurriel Jr. handled a grounder to his left, but he flubbed the throw bouncing it and forcing Justin Smoak to lunge to barely catch the wayward throw. Gurriel Jr. was replaced in the field the next inning. It's really too bad that Gurriel Jr. has struggled so mightily in the field. How much longer will the Blue Jays keep Socrates Brito around. Brito reminds me very much of Gift Ngoepe last season. Ngoepe lasted 13 games and in 18AB in 2018, Ngoepe had exactly 1 hit. Brito is now 0-18 through 5 games. Davis will likely be recalled when he is ready. In the bullpen, Tim Mayza and Javy Guerra were roughed up in multiple appearances over the weekend. Both could be optioned when Tepera is healthy. 7. Two streaks ended and one streak continued in baseball this week. Ken Giles blew his first save in over two and a half years, ending a consecutive save streak of 34 regular season saves. It's not so much the number of saves that is impressive, but that the streak took place over the course of three seasons, and in 2018 he played on two separate teams. Also, the Blue Jays aren't exactly the poster team for defense. Giles started a new streak Saturday, pitching a scoreless inning vs. Tampa Bay. A bigger, more dubious streak ended this week with Chris Davis finally breaking his hitless streak after going 54 straight AB's without a hit with a single to left. It's hard to imagine this is the same player who led the majors in HR just 4 seasons ago. It seems to be a confidence issue with the Orioles slugger, as he hasn't suffered a major injury that has hampered his playing abilities. Hopefully now that he has one hit (three actually) under his belt, he can get back to some semblance of the dominant player he once was. 8. The Seattle Mariners continued their MLB record streak hitting at least one home run in their 18th straight game to start the season as Mitch Hanigar went deep Sunday. The impressive streak has them off to a hot 13-5 start to the season. Ex-Blue Jay Edwin Encarnacion has 4HR for the Mariners so far. Jay Bruce leads the team with 7 dingers. 9. Finally, Monday is an important date in MLB History. It is Jackie Robinson day, and this year will mark 72 years since Robinson broke the color barrier and played in the majors. Making this year even more special, Robinson would have turned 100 this year. As per tradition, every team will wear #42 on the backs of their jerseys. Mariano Rivera, who retired in 2013 was the last active player to wear the now retired number. Here's what other teams will be doing Monday (and Tuesday if the home teams are off Monday) to commemorate this important day. 10. Blue Jay of the week: Freddy Galvis, who was the Blue Jays hottest hitter by far this week with 9 hits in 23AB, 5RBI, and 4 runs scored. The 29-year old infielder was the best off-season move made by Blue Jays GM Ross Atkins, although Matt Shoemaker was another smart signing, and Clay Buchholz had a strong first start of the season.